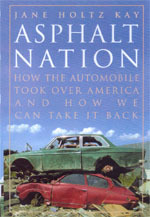 Asphalt Nation is a powerful examination of how the automobile has ravaged America's cities and landscape over the past 100 years together with a compelling strategy for reversing our automobile dependency. Jane Holtz Kay provides a history of the rapid spread of the automobile and documents the huge subsidies commanded by the highway lobby, to the detriment of once-efficient forms of mass transportation. Demonstrating that there are economic, political, architectural, and personal solutions to the problem, she shows that radical change is entirely possible. This book is essential reading for everyone interested in the history of our relationship with the car, and in the prospect of returning to a world of human mobility. Jane Holtz Kay is the architecture and planning critic for The Nation and the author of Lost Boston (1980) and Preserving New England (1986).